The Iridium 33 and Cosmos 2251 communications satellites collided over northern Siberia. The impact between the Iridium Satellite and the 16-year-old satellite launched by the Russian government occurred in February 2009. PARIS — The U.S. Air Force remains undecided about how much data it will make available on the whereabouts of satellites and orbital debris beyond what it publicizes now as it weighs orbital traffic safety concerns against the national security penchant for secrecy, the service’s deputy undersecretary for space programs said April 4. Commercial satellite operators and others interested in the growing problem of space debris have long requested the U.S. military loosen its grip on what it harvests from its sensors, which feed into a catalog of orbital objects. A portion of that catalog, called Two-Line Elements (TLEs), is made public to give basic information on a satellite’s whereabouts. Following the Iridium-Cosmos collision, the Air Force agreed to review whether it should be making public a larger share of the data it collects. McKinney said that process continues. “We’re looking at that, and we’re looking at M2M relationships,” McKinney said April 4 at the MilSpace 2011 conference organized by SMi Group of London, referring to automated, machine-to-machine communications that would manage data dissemination. “A policy on how we would share data, and whether we go beyond TLEs, is part of the review. The U.S. Space Surveillance Network is about to undertake a major upgrade of the Space Fence, a group of Very High Frequency radars deployed across the United States in a line at about 33 degrees north latitude. The upgrade, for which two $107 million design contracts have been awarded to competing teams led by Raytheon Integrated Defense Systems and Lockheed Martin Mission Systems and Sensors, will feature higher-frequency, S-band radars able to detect smaller pieces of orbital junk in low and medium Earth orbit. The Air Force has estimated that the new Space Fence, which could be operational by late 2015, will cost $3.5 billion. In parallel with its review of whether to make more information available, the U.S. Defense Department is signing bilateral agreements with nations with a demonstrated interest in space situational awareness. U.S. Defense Secretary Robert Gates has signed space-surveillance agreements in the past few months with Australia, Canada and France. During the two-day meeting, McKinney sought to portray the U.S. military as more interested than ever in cooperating with allies on space programs, in keeping with the new U.S. National Security Space Strategy, which was made public in January. But while the policy — spurred by the U.S. government budget crisis — may result in additional use of non-U.S. goods and services, it follows a long history of U.S. military purchases of foreign components for key space assets. For years, U.S. missiles and jet fighters derived their guidance from maps produced from French medium-resolution optical satellites. More recently, the U.S. government has signaled an interest in medium-resolution radar imagery collected by Canadian, German and Italian satellites. The main engine of the Atlas 5 rocket, one of the two principal vehicles used to launch military satellites, is built by NPO Energomash of Russia, with no plans to create a U.S. manufacturing facility for it. Ruag of Switzerland and Sweden supplies Atlas 5 inter-stage adaptors, payload fairings and shock-separation systems, McKinney noted, while British and Israeli companies provide avionics components for the rocket. The other workhorse launch vehicle for U.S. military satellites, the Delta 4, uses motor nozzles made in France, fuel tanks and engine valves from Japan, while welding and lathe machines for rocket parts are imported from Italy and Sweden. Rocket segments at the Air Force spaceports in Florida and California are moved aboard the Kamag vehicle, made in Germany. The U.S. Wideband Global Satcom (WGS) Ka-band telecommunications constellation features a satellite financed by Australia, and the Air Force is “looking to expand [WGS] partnerships with additional countries in the future,” McKinney said. In return for financing one satellite, Australia’s military gets access to the full WGS constellation. The Advanced Extremely High Frequency (AEHF) program includes contributions from Britain, Canada and the Netherlands, which are to receive AEHF constellation capacity in proportion to their investment. The U.S. 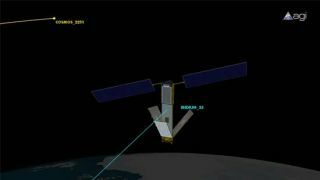 Global Positioning System of positioning, navigation and timing satellites, which are financed by the U.S. Defense Department but used by civil and commercial interests worldwide, also features cooperation for military navigation warfare development, McKinney said. Eleven nations have signed agreements to promote development of navigation-warfare capabilities in ways that facilitate coalition military engagements.